A-HOTEL.com - Luxury and cheap accommodation in Medovka, Russia. Prices and hotel, apartment booking in Medovka and surrounding. 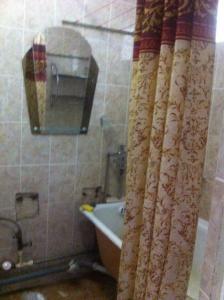 Gostinitsa Victoriya offers accommodation in Orenburg. Offering a restaurant, the property also has a fitness centre. Situated in Orenburg, in a building dating from 2013, Tysacha i odna noch features a bar and guestrooms with free WiFi. Featuring a 24-hour front desk, this property also provides guests with a restaurant. A 10-minute walk from Orenburg Trade Fair and the large Sovetskaya Street, this hotel offers a 24-hour reception, free Wi-Fi and free parking. Russian cuisine is served on site. Apartment Pink on Tereshkovoy 10/5 is set in Orenburg. The property, housed in a building dating from 1994, offers free WiFi. Apartment Green on Tereshkovoy 10/5 is situated in Orenburg. Complimentary WiFi is featured. Квартира на улице Плеханова, 4а is situated in Orenburg. The nearest airport is Orenburg Tsentralny Airport, 26 km from the apartment. Located in Orenburg, Central Light Apartment offers accommodation with a balcony and free WiFi. Guests staying at this apartment have access to a fully equipped kitchen. Located in Orenburg, Kvartira Tereshkovoy 10/7 provides accommodation with a balcony and free WiFi. The property has city views. Apartment on Tereshkovoy 10/7 is located in Orenburg. Guests may enjoy free WiFi. Located in Orenburg, Apartment on Tereshkovoy provides air-conditioned accommodation with a balcony and free WiFi. Guests staying at this apartment have access to a fully equipped kitchen. Апартаменты на пр. Больничный 10 is set in Orenburg and offers a bar. Located throughout the city centre of Orenburg, Home Apartments on Tereshkova features self-catering accommodations with fully equipped kitchens and free Wi-Fi access. The bright and modern apartments are equipped with a microwave, refrigerator, electric kettle, and kitchenware. Apartment Red on ulitsa Tereshkovoy 10/2 is located in Orenburg. Free WiFi is offered. Featuring accommodation with a balcony, Kvartira prospekt Pobedy 16 is set in Orenburg. Guests staying at this apartment have access to a fully equipped kitchen. Set in Orenburg in the Orenburg region, Apartment on Aksakova 28 features a balcony. Guests staying at this apartment have access to a fully equipped kitchen. Featuring a bar, Hotel Rai is located in Orenburg. All rooms boast a flat-screen TV with satellite channels and a private bathroom.